Bitcoin continues to push higher amid a relief rally but is getting near some powerful resistance at time and price. January and February 2019 highs and yearly 2019 highs up ahead. At the time of writing this article (1529 CST), Bitcoin was trading ta 4075.18 on Coinbase. That value is very close to two extremely important price levels. First is the January 2019 high of 4114.8 made on January 8th, 2019. 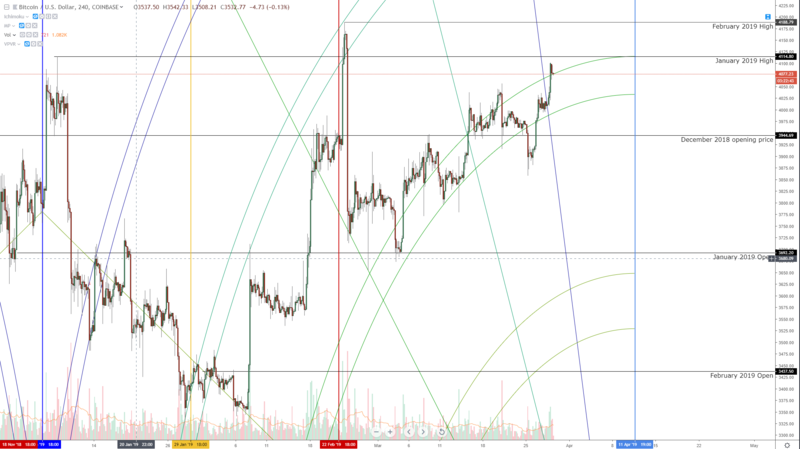 The second price level is 4118.79 which is both the February 2019 high and the current 2019 high – made on February 23rd, 2019. It wouldn’t take much for price to break these levels and experience a significant move to the upside. But it is good to identify this resistance early in order to protect recent profit and possibly lock in some of that profit. The threat to any continued upside momentum is very strong, especially at these current levels. 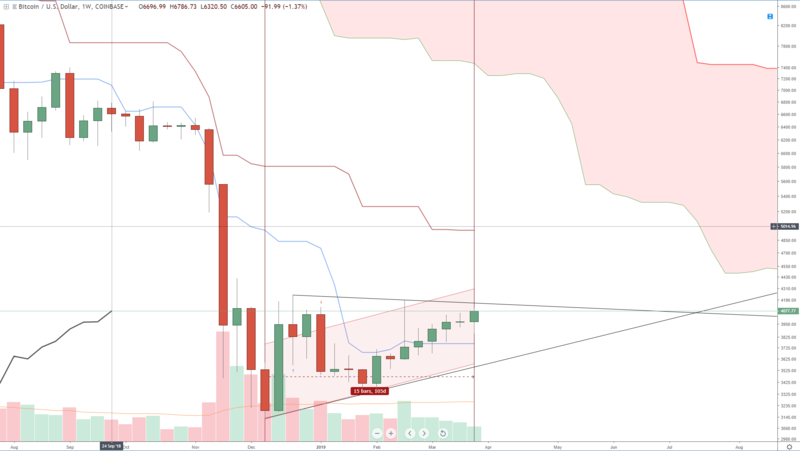 On the weekly Ichimoku chart, we can see several things that might indicate some profit taking and pullbacks in price. First, and most important, is the length of the move that Bitcoin has been in. From the 2018 low in December 2018 to the current week, we have been moving in an uptrend for 100 days – that is well within the 90-99 day Gann cycle of the inner year. Gann wrote that the 90-day cycle was the most powerful and most important cycle and that reversal often happened very fast. When we couple that time cycle against the current number of consecutive weeks that Bitcoin has traded higher, we’re getting into some territory where a pullback is certainly warranted and should be expected – 7 consecutive weeks – which also falls into Gann’s 49-day ‘death zone’. Gann wrote that the 49-day cycle often kills blow-off moves and begins a reversal in the prior trend. The Gann day counts certainly play into the price resistance discussed at the beginning of the article. There is further structural resistance on the daily chart. A downtrend line that begins from the swing high of 4239 on December 24th, 2019 to the next lower high of 4188 on February 24th, 2019 is just above the current price action. The top of that downtrend line is also very near the top of the Linear Regression channel. When we combine the presence of time cycles and price levels all cascading into one zone, the more probable scenario is a pullback. But we also need to be aware that a breakout is also probable. Almost all of the resistance levels in price that I discussed are in the same relative value area and Bitcoin has been pushing up against these levels for weeks. 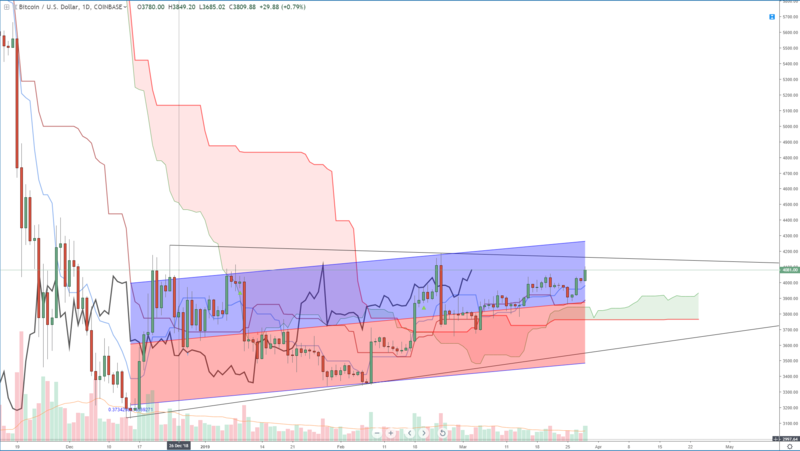 There is a strong bullish feature on the daily chart with the Ichimoku system: both price and the Chikou Span are above the cloud. Furthermore, the Chikou Span is in ‘open space’ (meaning it won’t trade against or inside future candlesticks over the next 5 to 10 periods). And the Gann time cycles themselves, while powerful indications of trend changes are also strong trend continuation cycles. As with any analysis, price action needs to be monitored. I am waiting to see if price does breakout above the trendline and the regression channel – but then I want to see it test that break and if buyers step in to support price and give credence to the breakout, then I’m all in again on this bull trade. trade.